I remember my anticipation a few years back when Mob Psycho 100 was originally announced as the next anime to be adapted from the manga of enigmatic creator, ONE, a man whom many will know as the mind behind the incredible One Punch Man. As someone who is a huge fan of One Punch Man, I had to temper my expectations for this brand new series with its humour that mocked the typical shonen tropes while simultaneously revelling in some of the most heart- pumping action and high level animation the genre has ever seen. It just won me over from the very beginning. It was unrealistic to anticipate more of the same and expect too much from this series (particularly when a different studio was behind the wheel). 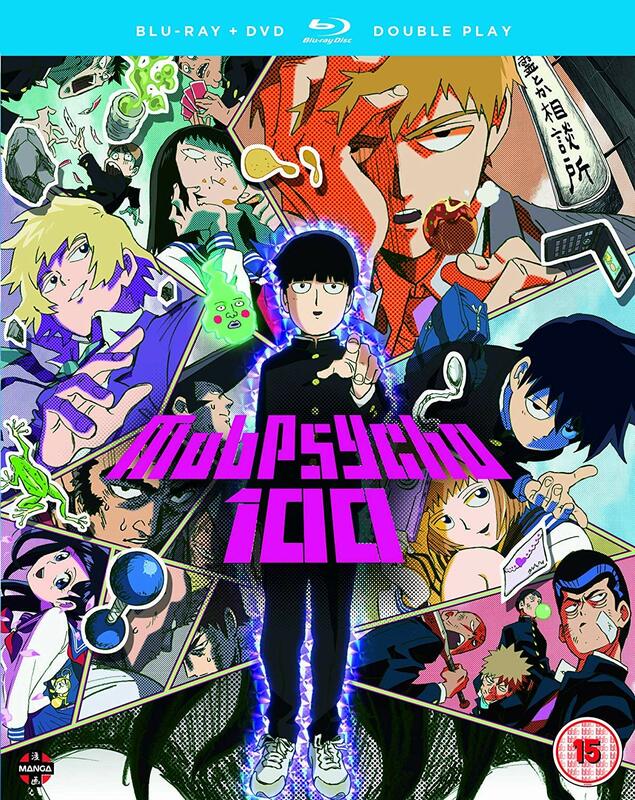 So I reined in my expectations to give it a fair shot; however I discovered Mob Psycho 100 was more than just a simple substitution of psychically powered espers for superheroes. Yes, there’s enough that’s familiar to engage fans of ONE’s previous work, but it’s also the new elements and a unique visual style and sound that earn our affection. Mob Psycho 100 follows the everyday life of eighth-grader Shigeo Kageyama, or “Mob” as he is often referred to. “Mob“ means “background character”, appropriate given the mundane nature of the character; his design is very plain, with no flair and sporting the always fashionable bowl cut. Even in terms of his personality, he is incredibly reserved, blank and expressionless the vast majority of the time. Appearances can be deceiving though, and much like Saitama in ONE’s previous work whose nonintimidating aesthetic masked phenomenal strength, underneath Mob’s unremarkable appearance lies perhaps the world’s most greatest psychic power. But unlike Saitama who wished to test the limits of his power and find challenges, Mob wishes to keep his power under control so as not to hurt those around him. This is signified by the “100” in the name, which represents a counter shown throughout the series, where it builds from 0 to 100 with the growing number showing Mob’s building stress. The 100 mark represents his inevitable emotional breakdown, resulting in his psychic powers being unleashed in psychedelic fashion. It all sounds very serious but with ridiculous hijinks on the road to this number such as ghost bikers and ridiculous cults among other bizarre events, poor, earnest Mob is continuously out of his depth. The downside to this formula can be that the pacing isn’t really suited to some, although it did not bother me personally. Due to the bigger events of the series only occurring when the counter hits 100 (which doesn’t happen once per episode) there may be some viewers who are not won over by the series’ humour that feel this build can be too long. In contrast to Mob, many of the other characters introduced are much more interesting in personality and design. Teruki Hanazawa, an early psychic rival to Mob, is much more brash and flamboyant. Even Mob’s brother Ritsu can be seen as a more interesting version of Mob, with a more interesting design (despite looking similar) and an outgoing personality that has given him the popularity in school that his brother lacks. 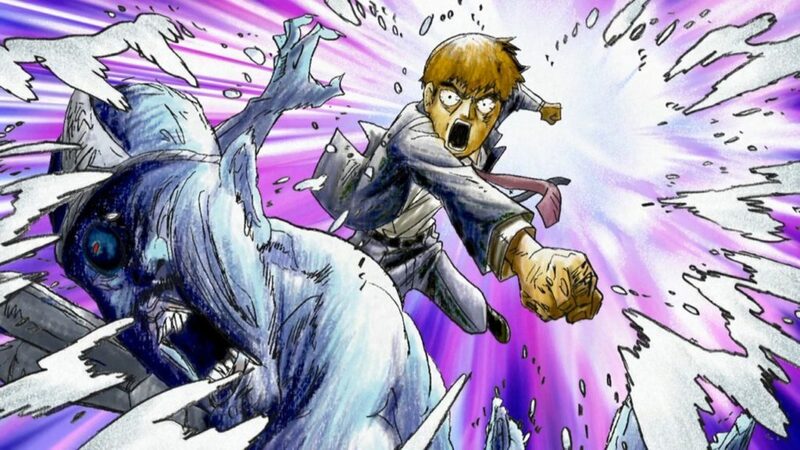 But the series’ standout character and my personal favourite, is Arataka Reigen. 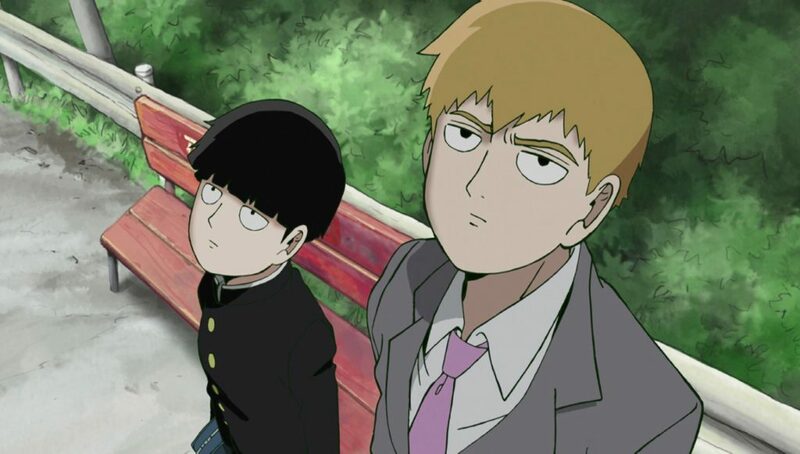 Reigen is Mob’s employer and mentor who educates Mob on the nature of his powers while Mob works part-time at Reigen’s exorcism business. 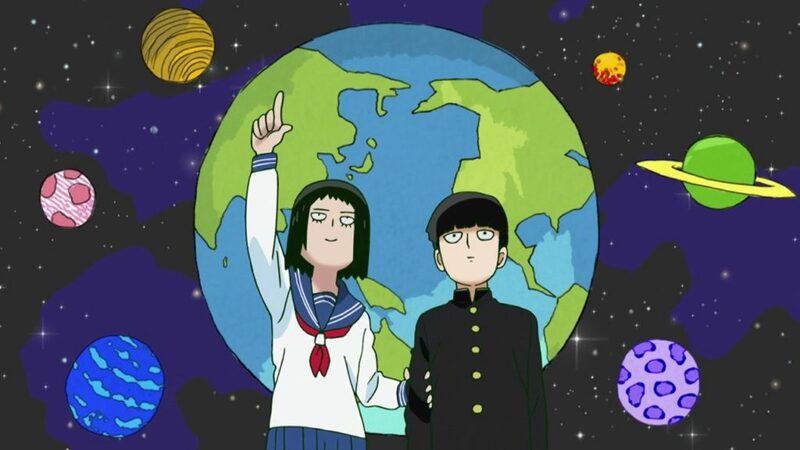 Mob admires Reigen and believes him to be one of the world’s most powerful psychics, except – he isn’t. Reigen is, in fact, a con artist. He has no psychic powers to speak of whatsoever, unless these somehow involve his skills as a masseur and having a decent understanding of photoshop. He tries his best to fool those who come through his door seeking his help with a quick massage or a throw of salt and if that doesn’t work, or an actual spirit shows up, he calls in Mob. Who then proceeds to eliminate the threat with ease and Reigen reaps the benefits, giving Mob a measly 300 yen cut. If the dynamic between Mob and Reigen was as simple as this throughout the series then it would become tiresome, even with a relatively short 13 episodes, however, Mob Psycho 100 continually shows its characters and relationships have much more depth than what is alluded to at the beginning. Mob may appear boring, but what lies underneath is a fantastic psychic potential, a potential that he fears and views as unnecessary. He has had to suppress his emotions all his life for fear of hurting anyone and despite having such awesome powers, only sees them as a burden. 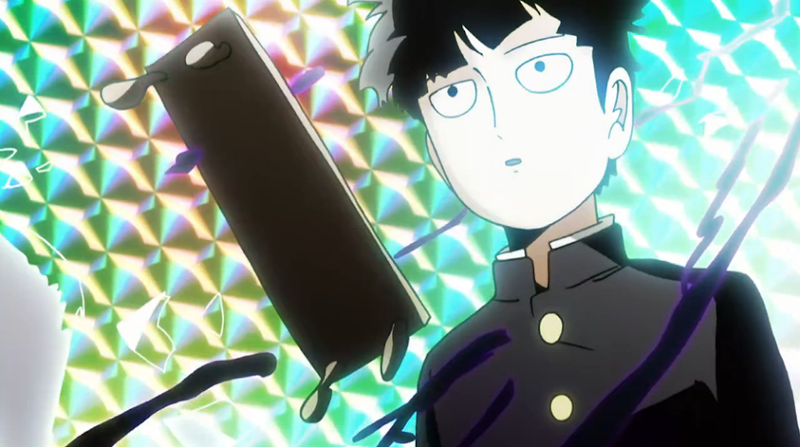 While several characters are envious of his abilities, Mob would rather have better social skills and popularity, skills he personally deems more important than psychic powers in everyday life. He may be presented as a background character but he doesn’t feel that he can truly fit in as he has to continually hold himself back emotionally. Despite being portrayed as a very mundane character on the surface, this makes Mob incredibly sympathetic. While Reigen is the opposite with no supernatural abilities but an abundance of confidence and charisma who, despite exploiting Mob for financial gain, actually cares very much for him. Ironically, he provides a sort of moral compass for Mob, asking that he never use his powers to hurt a person and to exercise a level of responsibility with them. Rather than being a mentor for his supernatural abilities, he is in reality a friend and guide through Mob’s particularly bizarre adolescence. He may be a con artist, but you find yourself cheering for him because, despite this, Reigen actually has some heart. It is inevitable that there will always be comparisons between this series and ONE’s other work, however, when it comes to animation being compared to the likes of One Punch Man is more than a little intimidating to say the least. MADHOUSE gathered a who’s who of the industry’s best animators and produced something of an animation showcase akin to the likes of Redline. Bones are no slouches themselves and instead went in a different direction stylistically. This is immediately apparent from the series’ opening with a massive psychedelic battle animated in the series’ signature loose line work with absolute fluidity. 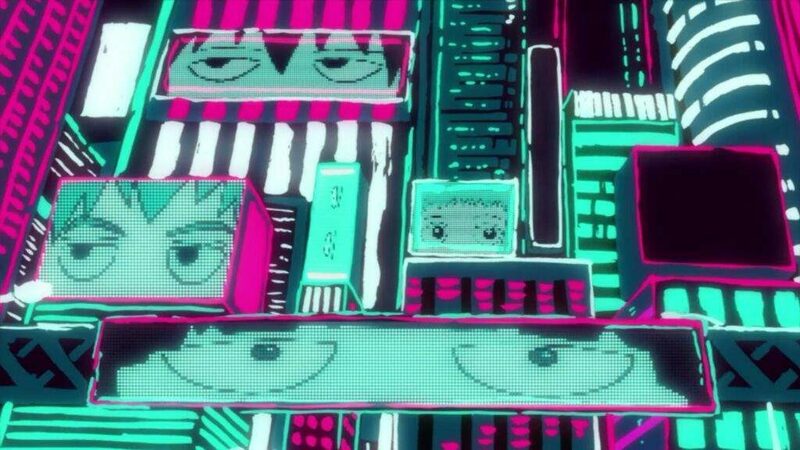 The psychedelia continues with the opening sequence as everyday items, food, and characters all interact and flow with one another, with splashes of every colour you can think of in what I can only describe as an eccentric animator’s fever dream. It’s bonkers, and I love it. In a show about the supernatural, in which humour is such a key part, this loose and expressive style that Bones have adopted perfectly embodies the mysterious and zany aspects of the show and makes it an absolute pleasure to watch. The music was composed by Kenji Kawai, who succeeds in creating an excellent soundtrack for a series by understanding its many parts. Mob Psycho 100 is part-action and part-comedy, but it is rooted in the supernatural. Kawai, having previously done the music for Hideo Nakata horror films such as Ring and Dark Water, brings an understanding of how sinister these elements are traditionally and there are parts of the soundtrack that would fit comfortably into any horror work. The series is one of contradictions, so it is appropriate that for every sinister song like, Shinobiyoru Lei, there is one that’s more playful such as, Yuru I Kakehiki or several guitar-driven tracks to underscore those bombastic psychic battles. It is not a soundtrack loaded with catchy themes that you would bop along to on your headphones but it is incredibly atmospheric and fits the series like a glove. The series’ opening is 99 by Mob Choir and it is fantastically catchy. I already mentioned how much I enjoyed the animation of the opening and this high energy track with powerful vocals caps off an all-round excellent opening. The closing theme is Refrain Boy by ALL OFF, a more emotional song that accompanies heavy-toned pencil-drawn animation, it works well and would have stood out more if I wasn’t already so taken by the series opening. The voice acting is great across both the original Japanese and the English dub cast. Although, I doubt either Setsuo Ito or Kyle McCarley would have had a particularly hard time voicing the monotone Mob, it was good that there were little subtleties demonstrated as emotions would build or he would be in an uncomfortable situation. 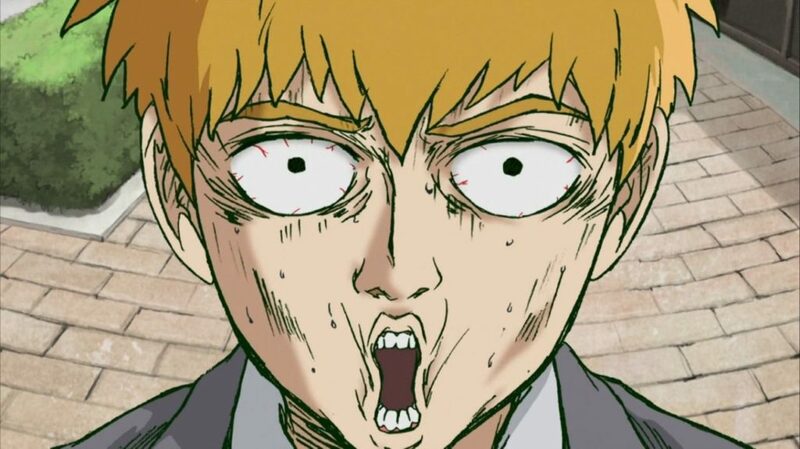 Takahiro Sakurai and Chris Niosi knocked it out of the park with their performance of Reigen, perfectly personifying his bursts of confidence and delusion, while still grounding him in those serious guiding moments with Mob. The first season of Mob Psycho 100 comes in a Blu-ray and DVD combo pack with the full 13 episodes, sporting both Japanese and the English dub audio. There are a few extras included: Mob Psycho Minis (a series of 6 8-bit animated shorts), Flipbook video (a cool but very brief flipbook style series of hand-drawn frames rapidly run through to make a great little animated sequence), Commercials (a series of advertisements for the series itself), and a textless version of the closing song “refrain boy”. It would have been great to see some behind the scenes work on the series, particularly one with such unique animation and style, I also personally enjoyed the opening much more and am surprised it was not given the usual textless treatment but this is a minor nitpick. Mob Psycho 100 presents the same self-aware humour that ONE is known for with his previous work, One Punch Man, and inverts different tropes for his overpowered protagonist. It shows that you can explore what seems like a very simple structure but keep it interesting as long as you have characters with the depth to get your audience invested in. The supernatural elements of the series are an absolute joy to watch, thanks to the excellent job done by Bones. With Season 2 currently streaming, if you’ve not watched this first season yet, it is absolutely worth viewing before you jump into Mob’s next set of challenges.